Power comes from organized people and organized ________. Let’s get to know Lauren Jacobson Spokane, an alumna of JOIN’s Jewish Organizing Fellowship, who is currently the Assistant Director of the Stroum Jewish Studies Program at the University of Washington, and leader at the Social Justice Fund NW. I became a community organizer as a JOIN Fellow after college because I had become infuriated about the level of economic inequality in our country. Through my work at the Greater Boston Interfaith Organization, the Jewish Community Relations Council of Greater Boston, and Just Congregations at the Union for Reform Judaism, I learned firsthand that that AMAZING things can happen when people come together to fight for issues that affect their lives. At the JOIN launch Summit in NYC in spring of 2012, I attended a workshop led by Margie Fine, a badass leader in the field of community organizing fundraising, and I realized the parallels between organizing skills and fundraising skills. First we get to know someone: we share stories, identify shared interests, and cultivate a relationship. Then, we determine the best way for someone to become involved, and make an ask to participate and lead, right? In fundraising, it’s exactly the same, only the ask is a financial contribution. Aha! 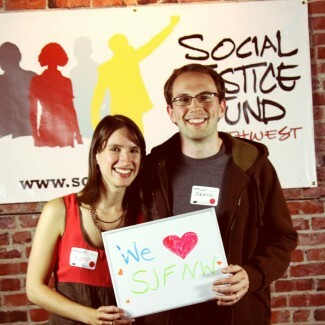 Back in Seattle, I discovered Social Justice Fund NW, and soon joined a giving project. 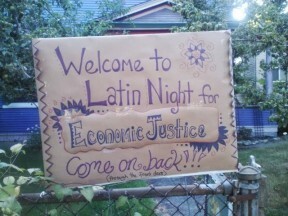 Our goal was to grant $10,000 each to at least 8 community organizing groups in the Northwest. While conducting site visits I realized how profoundly important grassroots fundraising can be for community organizing groups. One of the organizations we eventually funded, Got Green, told us about the difficult decision they faced when they realized that they could not continue their home retrofit job training program for young people of color in good faith, because the graduates simply weren’t getting jobs. They realized they needed to organize for policy change to address racist hiring practices. But when they switched from job training to organizing, they had to give back $80,000 in federal grants. They lost the support of local environmental organizations that were not interested in fundamentally challenging the status quo around racial disparity. Without individuals and other funders organizing to raise what’s needed for systemic change, “the revolution will not be funded,” indeed. A study by the National Committee for Responsive Philanthropy finds that for every $1 invested in organizing, communities in the Northwest receive $150 in public benefit, through big wins like raising the minimum wage and expanding access to Medicaid and CHIP. It’s clear this funding makes a huge difference. As a member of Social Justice Fund’s Economic Justice Giving Project, I raised over $9,500 through conversations with friends, family and colleagues. My cohort of 16 volunteer project members raised over $115,000. We were able to award grants to TEN community organizations across the Northwest! It was thanks, in large part, to my training as a JOIN organizing fellow that I was prepared to be successful as a grassroots fundraiser, and it was thanks to JOIN’s broadened mission to support a national network of Jewish organizers that I had the chance to learn from the wisdom and chutzpah of Margie Fine. If you’re intrigued by the potential of fundraising for social change, ask yourself: Why do YOU give? How do you decide what to give to? Have you asked a friend to join you in making a gift to an organization you care about lately? What would happen if you asked more often? This entry was posted in Alumni At Large, From the Field, Success Stories and tagged Alumni, alumni in the news, Change, Development, Network, Theory of Change. Bookmark the permalink.